Bamenda a city of two million people is the largest centre of the Anglophone region where there are armed secessionists and people have legitimate grievances about the Francophone dominated regime’s restrictions on the use of the English language in the courts and education. About 170 students at a Catholic school were taken by separatists in Cameroon earlier this month and later regained their freedom. Bishop George Nkuo of Kumbo told Crux that the kidnappers complained that the school was not abiding by Anglophone separatists’ call for a school boycott. “That is the crime we have committed: Allowing children to go to school,” the bishop said. According to a diocesan statement, unidentified gunmen came into the campus of Saint Augustine’s College shortly after 6 a.m. on Feb. 16 and abducted 170 students, 2 college security guards, one teacher and three of his children. “The children were in the dormitory and they (the attackers) first picked the girls, and by the time they got to the boys’ dormitory, some of them had hid themselves in the ceiling. So, only 15 boys were taken. The rest were girls,” Nkuo told Crux. 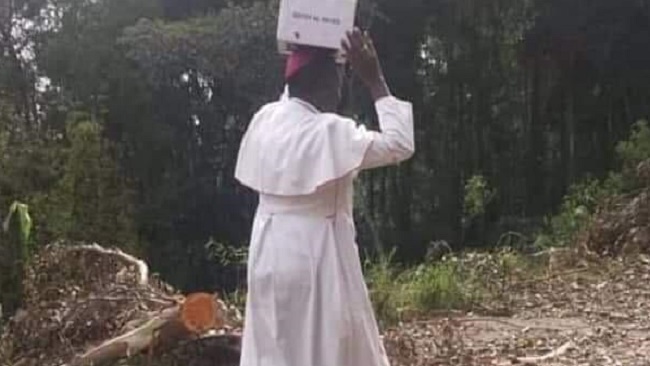 The bishop said they took the students “without a single gunshot.” Nkuo said the children were shepherded “far off into the forest, about 30 kilometers, on foot.” Asked whether the students were ill-treated by their captors, the bishop answered in the negative. “From the echoes I got while they were still out there, they were well treated. They were given good breakfast – rice – and they even commented that there was some good meat inside.” Nkuo said the children and the staff were released in the evening of Feb. 17. He said the release was “a big relief” for him as their bishop, but an even “bigger relief for the parents.” “I could see pain and anxiety; the parents were so traumatized. They weren’t sure whether the children would come back alive or dead. 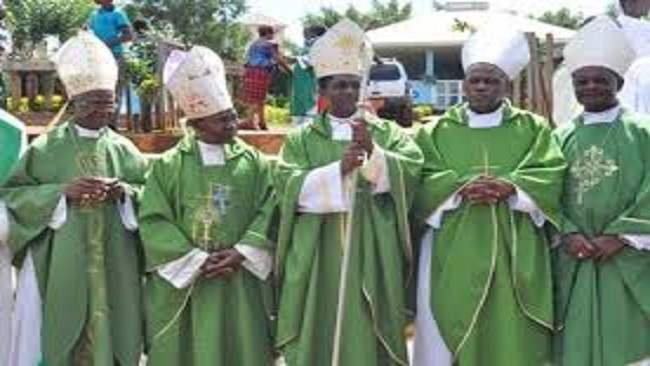 There is great joy, great celebration to see them all return,” the bishop said. The Northwest and Southwest regions of Cameroon are majority English-speaking, a legacy of the colonial history of the country: Cameroon was originally German, but after World War I the defeated country transferred it to the allies, and it was divided between France and Britain. The government has been accused of razing entire villages and extrajudicial killings in their hunt for separatists, who are calling on the English-speaking areas to form a new country, called ‘Ambazonia.’ Separatists have also been accused of atrocities, and have attacked Cameroonian security forces, and kidnapped opponents for ransom. Nkuo said he was grateful to all the sympathizers and persons of goodwill who gave the community moral support in these two days of “grave concern and anxiety.” It’s not the first time the school has come under attack. Some months back, the principal was taken, along with some members of staff. On Feb. 12, some students and staff were taken by yet another group. The latest kidnapping happened barely three months after nearly 80 students were kidnapped by suspected separatists in a Presbyterian school in the regional capital, Bamenda. On Monday, the Vatican’s Secretary for Relations with States, Archbishop Paul Richard Gallagher, reportedly offered to mediate in the conflict when meeting with Cameroonian officials on the sidelines of the UN Human Rights Council meeting in Geneva. Attacks on clergy are increasing in the anglophone areas of Cameroon, as tensions rise between English-speaking separatists and the French-speaking government. 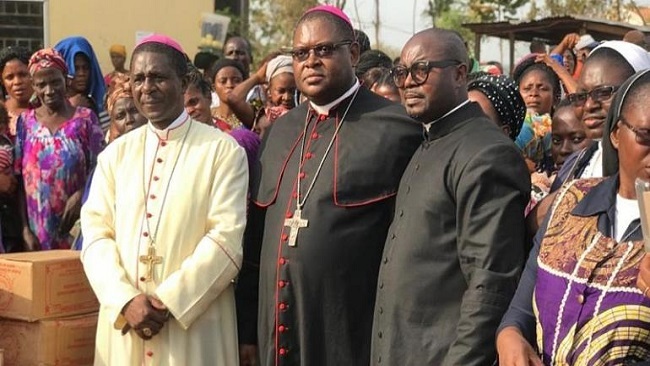 Bishop Michael Bibi of Bamenda in anglophone south-west Cameroon told Catholic charity Aid to the Church in Need that the spiralling conflict between separatist groups and the francophone central government is putting Church workers at risk. Nineteen-year-old seminarian Akiata Gerard Anjiangwe was killed by soldiers on 4 October 2018 outside St Therese’s Church in Bamessing village, near Ndop, northwest Cameroon. Bishop Bibi told ACN that, despite renewing its efforts to promote dialogue between separatists and the government, the Church is accused by both parties of taking sides. He said: “We tell the young people to stay in school and not join the militias, that it will lead to nothing – and so the militias accuse us of playing the government’s game for them. “But we also denounce the actions of the government army and call for the region to be demilitarised – and so all of a sudden we are accused by the authorities of siding with the rebels. An ambulance dispatched by a Catholic Church-run hospital in Cameroon continued saving lives this month amid fresh outbreaks of violence between the military and armed groups. Elengu Noella, 27, told voanews.com that the vehicle whisked her and four other women to safety during a firefight between security personnel and separatists but two of her three children were killed in the heavy fighting near the town of Buea. Cameroon said this week it is mobilizing troops along its northern border with Nigeria as Boko Haram and its splinter group, the Islamic State in West Africa, step up their attacks. In January alone, the military has recorded five incursions by insurgents near the border and in the Lake Chad basin, with three people killed last week, the media reports. Meanwhile, Cameroon, which is also fighting separatists in its English-speaking western regions, is believed to have sent thousands of refugees back to Nigeria. The situation worsened in Nigeria in 2018, capped by a brutal massacre in November when a Boko Haram strike on a military base killed up to 100 soldiers. Now Cameroon seems bent on sealing off the border as the terrorist group continues to recruit fighters from within its territory. Defense Chief of Staff Lt. Gen. Rene Claude Meka has vowed to fight fire with fire, saying this year will see Cameroon fight for national unity and territorial integrity. “2019 will not be a bed of roses,” Defense Minister Joseph Beti Assomo said on Jan. 21. The Catholic Church is increasingly caught in the middle of an escalating crisis in Cameroon’s North West and South West regions with priests shot dead, property destroyed and frequent detentions by armed separatists, according to a high-ranking church official. “They threatened that they’re going to kill us,” said Bishop Michael Bibi of the Bamenda archdiocese, following a recent detention by armed separatists. Bibi was detained twice this month by armed groups. On 5 December he attempted to travel from Bamenda, the capital of the North West region, to Kumba, 170 kilometres to the south west, intending to celebrate mass. However, on the road near Batibo his car was stopped and held up by a group describing itself as the “Amba Boys”. “They saw that I was a Roman Catholic bishop, but they were not willing to listen to me, they demanded my phone and the phones of my driver and his brother,” said Bibi, describing how their car was forced off the road into a clearing in the forest. The Ambazonia fighters brandished hunting rifles and rudimentary weapons. 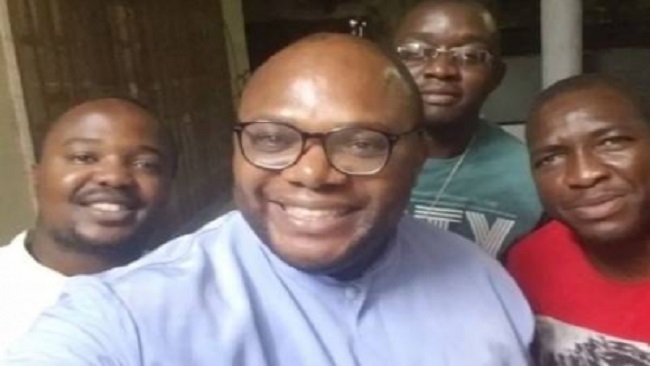 On this occasion, the local leader of the Amba Boys group told his foot soldiers to return the priest’s phone and let him continue his journey. Bibi went on to Kumba to say mass. He had been warned that a group of nuns also had difficulties on the road. They were stopped by the Amba Boys and consequently arrived late for a church service. Nevertheless, Bibi went ahead with his journey because he was “doing missionary work”. After passing a village on the way to Buea, the capital of the South West region, the Amba Boys “came out with their guns”, according to Bibi. The armed separatists said the bishop should not be travelling owing to the “ghost town” protest that was in force for the day – travel was prohibited. 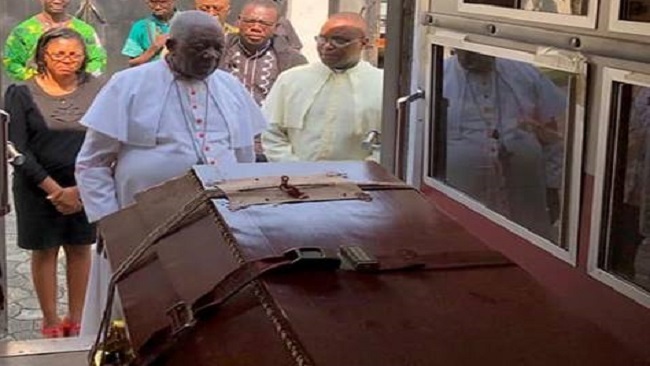 “They weren’t happy that I didn’t support the ghost town,” the bishop told RFI, explaining that the Ambazonia group had no gripes over whether the man of the cloth was pro-government or a supporter of the separatists. “It was actually scary,” said Bibi, describing how the armed group kept him for the second time in the forest, this time for four hours. They said he was “breaking the law” for travelling that day given the stay-at-home protest intended to paralyse the area. “Finally by the grace of God they liberated us,” said Bibi. He was let go, but it was too late to continue travelling by night. So he stayed in a nearby village before leaving early the next morning and celebrating mass. 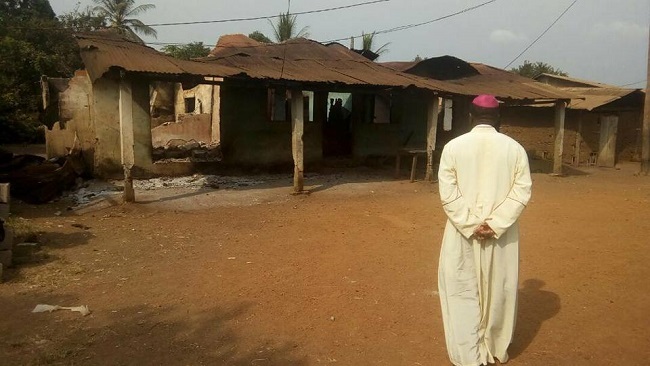 Bishop Bibi’s recent experiences on the road in Cameroon’s Anglophone regions are indicative of a greater threat facing priests. A number have been killed in recent violence while church property has also been targeted. Gerard Anjiangwe, a seminarian, was killed in Bamessing village near Bamenda in October. “He was shot by the military and died on the spot,” said Bibi. The separatist groups are not happy with the Church’s stance on the ghost town protests and in particular the closure of schools, according to Bibi. The Church does not support the closing of schools despite the ongoing crisis. 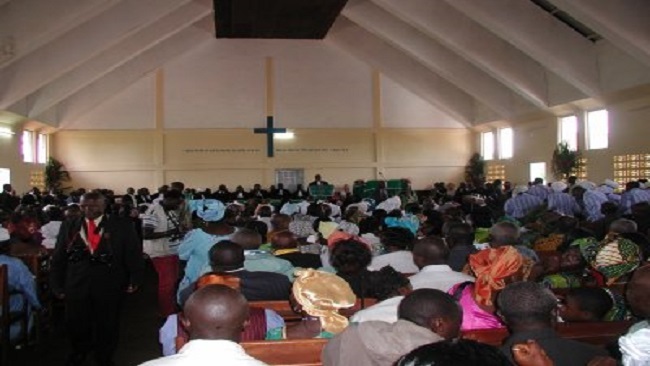 There have been previous calls for the church to spearhead mediation for the Anglophone crisis. The International Crisis Group, a London-based think-tank, said that the Catholic Church remains one of the few “prospective peacemakers”. “If we are requested at any time to come in, to give our own contribution towards the resolution of the crisis, we are not going to hesitate to do that,” said Bibi, referring to the possibility of mediation. “We just want the government and those that are fighting the cause to know that the church stands for the truth, the church stands for justice and we are ready to stick out our necks and speak the truth because only the truth is going to set us free,” he added, referencing a passage from the gospel of John. Some Cameroonian Muslim and Christian Faithfuls have said that corruption must be eradicated from the country. This was during an-inter religious service organised on December 10 at the Yaoundé conference centre by the National Anti-Corruption Commission to celebrate the International Anti-corruption day and the end of the African year against corruption. The service under the Theme “Fight against Corruption: Exploring a Faith Based Solution” began with a Catholic cleric who said “Corruption is sin and a blasphemy. It destroys the human person and the society like a cancer. 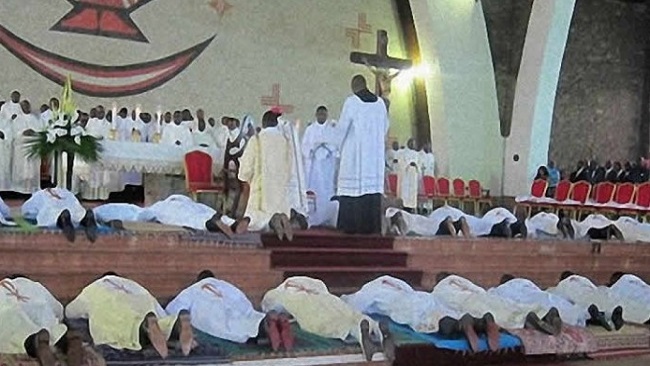 The priest called on all Cameroonians to live the faith as spotless lamb,” as reported by Journal du Cameroun. Meanwhile, the PCC cleric opined the true quality of one’s life is not determined by the amount of wealth he has but by the quality of character. “Let corruption not come between us and eternity. Carry your Faith into your job and business places”. For his part, the Muslim Minister said corruption is an abomination. The preachers from all added their voices through sermons and prayers for corruption to be eradicated. Reacting to the sermons, the Chairman of the National Anti – Corruption Commission Rev. Dr. Dieudonne Massi Gams, express gratitude to preachers. “We hope that this faith-based solution to fight corruption in Cameroon will bring a breakthrough in the fight by moralizing Muslims and Christians for a change of attitude.